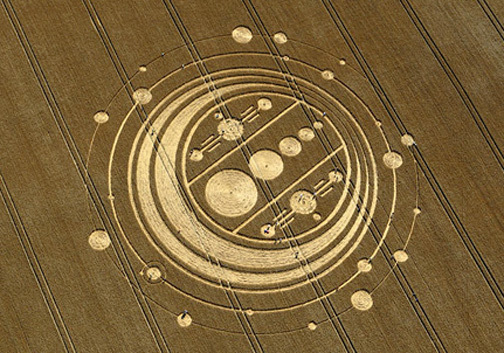 Upper left purple circle marks location of Windmill Hill near the ancient stones of Avebury. 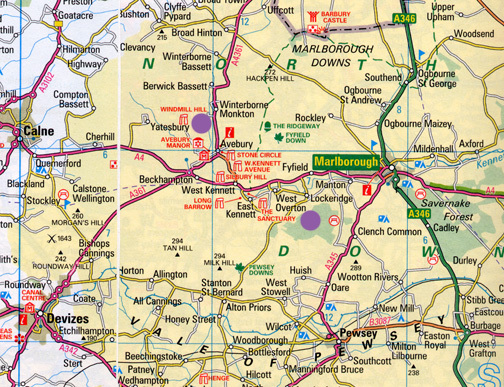 The lower right purple circle marks the location of West Overton near Lockeridge, both in the English county of Wiltshire. August 17, 2009 Albuquerque, New Mexico - The morning of August 6, 2009, when I and others first went to the remarkable Windmill Hill formation, it was still raining after nights and days of rain. But the next day on August 7, 2009, the clouds lifted, sun came through and Charles Mallett took his 20-foot-pole and camera to the Windmill Hill pattern.